SMT have been part of exciting wind projects all over the globe ranging from 1.5MW to 7MW installations. The following are some examples of these projects and some feedback from the clients. 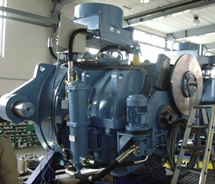 SMT’s Portugal team developed a number of gearboxes for two globally leading energy companies based in Europe including 1.5MW and 2MW gearboxes. Development included design, analysis, testing and manufacture support. SMT developed 2.05MW differential with flexible pin design for a Chinese manufacturer. Responsible for supervising the client’s team to conduct design and analysis as well as providing some support in manufacturing, assembly and testing. Flexible Pin designs often suffer from high noise, however this design produced much lower noise values throughout testing. This couldn’t have been achieved without the combination of SMT’s experience in Wind Turbine Gearbox design and production. It was highly impressive to achieve the design correctly first time for such a high power gearbox and in a relatively short period of time. Designing the next generation of Wind Turbine Gearboxes. In this design, the gearbox contains only parallel fixed shafts or multi lay shafts.